Oval NASCAR NASCAR Cup Series Rain racing at the Charlotte Roval? Next week, NASCAR heads back to Charlotte Motor Speedway. Only, it wont be in any form they’ve seen it in the past. The brand new Charlotte Roval is set to make it’s debut. The track will feature 17 turns across 2.28 miles. The race distance is set at 1,312,336 million′ 0″ or 248.52 miles. But, here’s the most interesting part about the Roval next week… Precipitation is a possibility. As of the Friday leading up to the Roval, it was in the forecast. In fact, they were calling for rain on Friday, Saturday and Sunday. 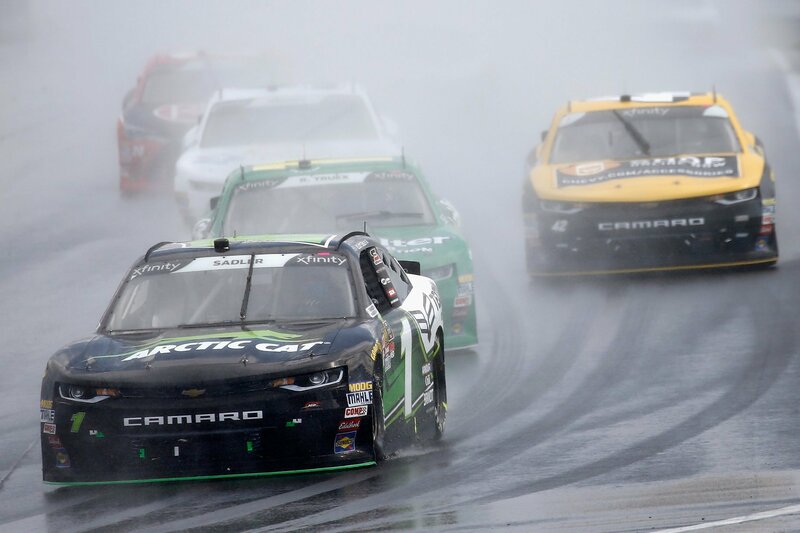 If needed, NASCAR will pull out the rain tires for the Charlotte Roval 400. So far, drivers have had a difficult time making it around the Roval without tearing up the race car. And that’s just in an open test session. In addition, the NASCAR Xfinity Series will be in the show as well. It’s not a cutoff race for those guys but it’s still an important race on the schedule. 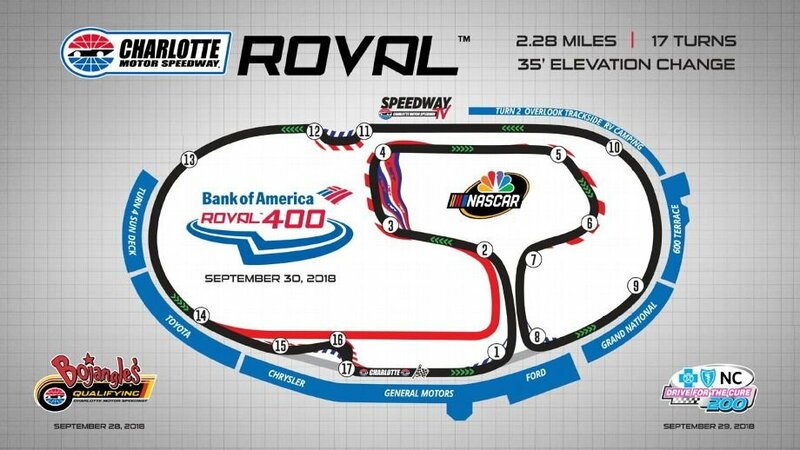 Ironically, the Roval is a road course and an oval in one. Rain tires have never been used on an oval. In fact, I don’t know of any oval series that uses rain tires with the exception of the ice racers. That stat could change as well given they basically run the entirety of the oval in the new Charlotte road course layout. The Monster Energy NASCAR Cup Series has yet to race in the rain, ever. That’s another stat that could change. The MENCS drivers race in Sonoma, California and Watkins Glen, New York when it comes to other road courses. It’s highly unlikely they’ll ever see rain at Sonoma in the middle of the summer. But, now, a third road course has been added. Charlotte, North Carolina averages 44 inches of rain per year. The odds of seeing the NASCAR Cup Series in the rain have just significantly increased. “I can’t wait to see the cup guys. Us Xfinity guys have to do this all the time. I can’t wait to see how the cup guys react to have to go out there in the rain. Good for them. I’m looking forward to seeing those guys race in the rain,” Elliott Sadler continues. “But rain should be fun. It’s always so much fun on a road course. Those rain tires work really good. They do a good job,” Sadler pauses with laughter from the media center. Rain or shine, the Charlotte Roval is going to be exciting and there’s going to be some hurt feelings for some as they climb back into their helicopters. Below is a clip from a recent Goodyear tire test at NASCAR’s newest race track. You’ll see that a lot of drivers are struggling to avoid the guardrails. Specifically, the tight inside section has been tossing out headaches. The first video are the highlights. The second video is an extended version of the test session. Related: Rain racing in a dirt late model?